Her mouth was a steaming tropical jungle, her muscular tongue a snake twining around me. I closed my eyes and allowed myself to sink into pure sensation. 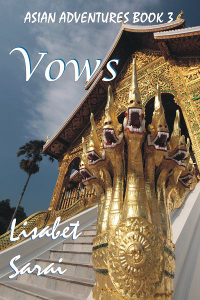 One Response to "Vows (Asian Adventures #3) by Lisabet Sarai (@lisabetsarai)"
Thanks for sharing my news. The post looks fantastic!